The X-48 is an experimental unmanned aerial vehicle for investigation into the characteristics of blended wing body (BWB) aircraft, a type of flying wing. It is currently under development by Boeing and NASA. Boeing had studied a blended wing body design. It found that passengers did not like the theater-like configuration of the mock-up. The company dropped the design for passenger airliners, but reserved it for military aircraft such as tankers. McDonnell Douglas developed the X-48 concept in the late 1990s, and presented it during an annual Joint AIAA/ASME/SAE/ASEA Propulsion Conference in 2004. The McDonnell Douglas engineers were confident that their design had all the advantages mentioned, but their concept found no favor at Boeing after their merger. The most difficult problem they solved was that of ensuring passengers a safe and fast escape in case of an accident, since emergency door locations were completely different from those in a conventional aircraft. The blended wing body (BWB) concept offers advantages in structural, aerodynamic and operating efficiencies over today's more conventional fuselage-and-wing designs. These features translate into greater range, fuel economy, reliability and life cycle savings, as well as lower manufacturing costs. They also allow for a wide variety of potential military and commercial applications. Boeing Phantom Works is developing the blended wing body aircraft concept in cooperation with the NASA Langley Research Center. 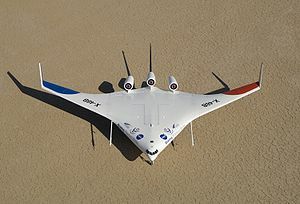 In a continuing effort to study the flight characteristics of the BWB design, a remote-controlled propeller-driven blended wing body model with a 17 ft (5.2 m) wingspan was successfully flown in 1997. The next step was to fly the 35 ft (10.7 m) wide X-48A in 2004, but that program was later canceled. Boeing Phantom Works is focusing current research on a pair of models, called the X-48B, which were built under contract by Cranfield Aerospace in the United Kingdom. Norman Princen, Boeing's chief engineer for the project, said, "Earlier wind-tunnel testing and the upcoming flight testing are focused on learning more about the BWB's low-speed flight-control characteristics, especially during takeoffs and landings. Knowing how accurately our models predict these characteristics is an important step in the further development of this concept." The X-48B has a 21-foot (6.4 m) wingspan, weighs 392-pound (178 kg), and is built from composite materials. It is powered by three small turbojet engines and is expected to fly at up to 120 kn (220 km/h) and reach an altitude of 10,000 feet (3,000 m). The X-48B is a scaled down from a conceptual 240-foot wide design. Though passenger versions of the X-48B have been proposed, the design will more likely be first used for a military transport. Wind tunnel testing on a 12 ft wide blended wing body model was completed in September 2005. NASA performed wind tunnel tests on X-48B Ship 1, an 8.5% scale model, at a facility shared by Langley and Old Dominion University during April and May 2006. After the wind tunnel testing, the vehicle was shipped to NASA's Dryden Flight Research Center at Edwards Air Force Base to serve as a backup to X-48B Ship 2 for flight testing. Ground testing at Dryden began in November 2006, to validate the aircraft's systems integrity, telemetry and communications links, flight-control software and taxi and takeoff characteristics. The X-48B first flew on July 20, 2007. The BWB reached an altitude of 7,500 feet (2,286 m) above MSL and lasted 31 minutes. This began flight testing. The remotely-piloted aircraft was successfully stalled for the first time on September 4, 2008, with fixed leading edge slats, a forward center of gravity, and 23-degree angle of attack (2� beyond the maximum coefficient of lift). Stall testing was repeated on 11 September with a NASA pilot at the console. 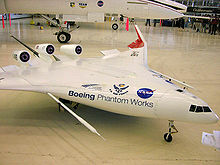 NASA and Boeing successfully completed initial flight testing of the Boeing X-48B on March 19, 2010. Fay Collier, manager of the ERA Project in NASA's Aeronautics Research Mission Directorate commented on the completion of the first phase of testing saying, "This project is a huge success. Bottom line: the team has proven the ability to fly tailless aircraft to the edge of the low-speed envelope safely." Following the installation of a new flight computer later this year, the X-48B will continue a new phase of flights tests that are to focus on additional parameter identification investigations. In addition, the team managing the project is also preparing a second hybrid wing body aircraft: the X-48C for future flight tests, which is intended to have a lower noise profile. A second phase of flight tests with the X-48B was to begin in September 2010. Afterwards the second X-48B will be modified into the X-48C for flight tests in 2011. The X-48C will have its vertical stabilisers moved inboard on either side of the engines, and its fuselage extended aft, both in an attempt to reduce the aircraft's noise profile, and will be powered by two JetCat turbines, each producing 80 pounds-force (0.36 kN) of thrust. Rose, Bill, 2010. Secret Projects: Flying Wings and Tailless Aircraft. Hinckley, England: Midland Publishing.